Our 1.5 Carat Oval Cubic Zirconia Classic Solitaire Pendant in 14K White Gold features a 9x7mm Russian formula stone that is hand cut and hand polished to exact diamond specifications. This traditional style of mounting is a perfect birthday gift or anniversary gift for the one you love. This Classic Solitaire Pendant features a 1.5 carat brilliant oval basket set lab created laboratory grown simulated diamond in a V shaped bail, double bail, or also referred to as a rabbit ear bail. Available in 14k white gold. 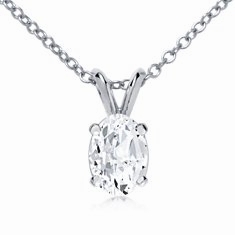 This diamond quality pendant comes standard with a 16 inch fine rope chain. An upgrade to an 18 inch necklace is available. Please see the pull down menu for options. For further assistance, please call us directly at 1-866-942-6663 or visit us via live chat and speak with a knowledgeable representative.